[United States] : Home Vision Entertainment : Criterion Collection, 2001. Classic collection. ; Criterion collection, 143. Middle-aged man falls in love with a much younger woman in this satire of sexual obsession. Louÿs, Pierre, -- 1870-1925 -- Film adaptations. French language with English subtitles, or an optional English dubbed track. Videorecording of the 1977 motion picture. Based on the novel La femme et le Pantin by Pierre Louÿs. Special features: Video interview with screenwriter Jean-Claude Carriére; excerpts from Jacques de Baroncelli's 1929 silent film, La femme et le Pantin, an alternative film adaptation of the book on which this film is based; reprinted interview with director Luis Buñuel; theatrical trailer. Director of photography, Edmond Richard. Fernando Rey, Carol Bouquet, Angela Molina, Julien Bertheau, André Weber, Milena Vukotic, Maria Asquerino, Pieral. 1 videodisc (126 min.) : sound, color ; 4 3/4 in.+ 1 booklet ( pages : illustrations ; 18 cm). DVD, Dolby digital mono, aspect ratio: 1.66:1. Special features include: Video interview with screenwriter Jean-Claude Carriére; excerpts from Jacques de Baroncelli's 1929 silent film, La femme et le Pantin, an alternative film adaptation of the book on which this film is based; reprinted interview with director Luis Buñuel; theatrical trailer. 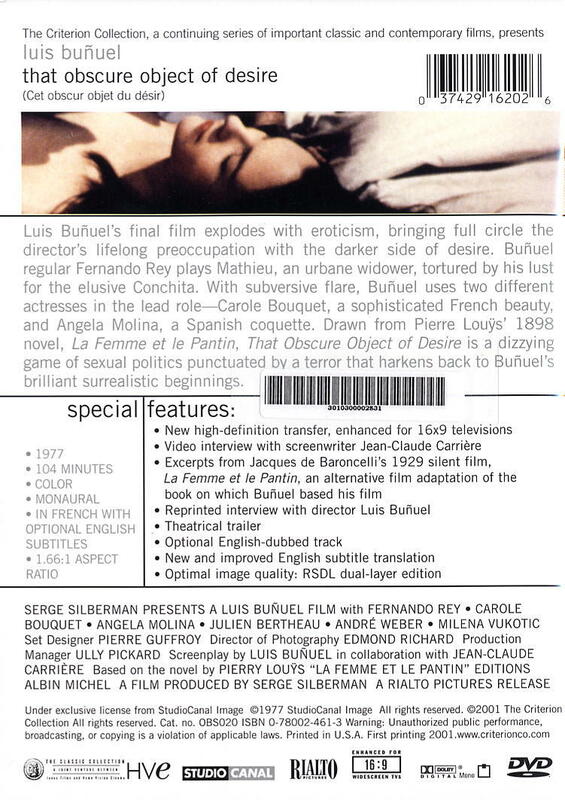 Serge Silberman presents a Luis Bunuel film, a Rialto Pictures release ; Janus Films ; First Artists ; screenplay, Luis Buñuel and Jean-Claude Carriere ; director, Luis Buñuel. Add tags for "Cet obscur objet du désir". Be the first. rdfs:seeAlso <http://experiment.worldcat.org/entity/work/data/2824531170#CreativeWork/femme_et_le_pantin> ; # Femme et le pantin. schema:about <http://experiment.worldcat.org/entity/work/data/2824531170#Place/frankrijk> ; # Frankrijk. schema:contributor <http://viaf.org/viaf/153939519> ; # Rialto Pictures LLC. schema:isPartOf <http://experiment.worldcat.org/entity/work/data/2824531170#Series/classic_collection> ; # Classic collection. <http://experiment.worldcat.org/entity/work/data/2824531170#CreativeWork/femme_et_le_pantin> # Femme et le pantin. <http://viaf.org/viaf/153939519> # Rialto Pictures LLC.